SMALL WORLD Comments from the staff at Winter with no-name,... The snow in the South of France , is good NOW ! I have asked for a few pics , we'll see. Experience royal treatment and go glam without breaking the bank. Department stores are decked out for the festive season, offering a superior shopping experience and enticing sales. Taynton Bowl is Panorama’s newest terrain expansion and was named best new terrain by SKI and Ski Canada magazines. The powder-bowl features almost 1,000 acres of backcountry style terrain including chutes, glades, and gullies. On the front-side super-long cruising runs groomed to perfection will thrill skiers and riders of all abilities. An expert and an intermediate terrain park round out the mountain’s offerings with rails, tabletops, and a halfpipe. Panorama offers night skiing and riding in the parks and in the halfpipe with dedicated access on the Toby Chair. Dec 24 Service on the Summit & Evening Christmas Eve Service Dec 26-31 New Years Celebrations and Fireworks! I am happy that Bill S. In SugarLoaf Corp. Marketing has agreed to allow the posting of thier news , events and updates. Sugarloaf/USA is located in the heart of Carrabassett Valley, which was carved by the Carrabassett River and is surrounded by Maine's Western Mountains. Maine's largest cities, Portland and Bangor, offer major airport service to Sugarloaf. Maine's second highest peak at 4,237 ft. Only lift-serviced above-treeline skiing in the East. Vertical: 2,820 ft. - The most continuous in New England! Lifts: 15 - Two SuperQuads, two high-capacity quads, 8 doubles, 1 triple, 2 surface lifts. Boston based acoustic rock trio. Come see the Brightwings at The Widowmaker Lounge Friday and Saturday Night at 9:30pm! Join us for Apres Ski on Saturday at 3:30pm. An annual tribute to the small furry creature that is rare in the East and only inhabits above-treeline alpine areas. As a way of thanking the loyal supporters in the surrounding communities, during this week, Sugarloaf is offering free lift tickets, equipment rentals and morning adult and kids lessons to all residents (with valid ID) of the following towns: Eustis, Stratton, Carrabassett Valley, Kingfield, New Portland, West New Portland North New Portland, Freeman, Rangeley, New Vineyard, Strong, Phillips or Farmington. Santa Fe is scheduled to open Dec. 10 - pushed back from Nov. 24; Angel Fire should open Dec. 16 and, Pajarito is shooting for mid-December. Everyone else is up and running. Take advantage of the Taos Half-Price sale going on until Dec. 16: half price lift tickets. Alpine Meadows is officially opening for the 2005/2006 winter season this Friday. With new snow, plenty of pent up demand and a long season ahead of us, now is the time to grab your gear and take the season’s first turns at Alpine Meadows. Opening day schedule includes the Kangaroo Chair, accessing intermediate through advanced terrain, as well as 4–6 jib park features. Alpine Meadows will announce additional chairs as conditions permit. Winter is definitely here! It's snowing again on the mountain. With gusty winds and temperatures in the 30s, forecasters expect snow to continue through Friday. Keep your fingers crossed - some say up to 3 feet is possible! With a base depth of 12-18 inches of packed-powder, man-made and machine-groomed snow, today we plan to operate Broadway Express, Stump Alley Express, Facelift Express, Thunderbound, Discovery Chair and the Lower Panorama Gondola. Of course, this is wind and weather permitting. We will be updating our online snow report on a real-time basis as conditions and operations change. Anticipation is still on the rise as crews continue work on the Super Pipe. No place on earth offers a better prospect of this intoxicating combination than Switzerland. Nearly 50 12,000-foot peaks scrape the sky. 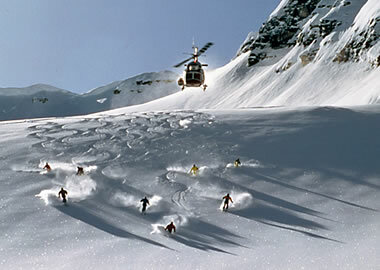 Just below them lie some of Europe’s highest winter sport resorts. 29 of these are located at over 8'400 feet, or higher.